Only a short six-hour ride on board the shiny new bullet trains moving at 230km per hour from Beijing, the formerly sleepy port city of Qingdao will be host to the Olympic sailing events for 2008. As a sport with relatively high costs and requiring access to the ocean or at least large lakes, sailing is not a popular sport in China but is emerging as a favorite of the newly rich. In Qingdao and Beijing the influence of class has fundamentally affected government planning and China’s Olympic development. Rather than bring investment and tourism into poor or less developed areas, most Olympic venues in both Beijing and Qingdao are concentrated in the wealthier parts of town. Post-2008 the incredible facilities built at great expense will likely remain as isolated from ordinary citizens as during the Olympics itself. As a former German colony from 1898-1914 Qingdao is justly famous for its European-style architecture with tree lined streets and stone buildings. Over the past twenty years, new development has seen investment pouring into Qingdao as it became the ideal commercial center for easy access to the Shandong countryside. North of the old city, glittering skyscrapers housing the main Chinese banks and luxury highrises line the shore heading to the Olympic event center. 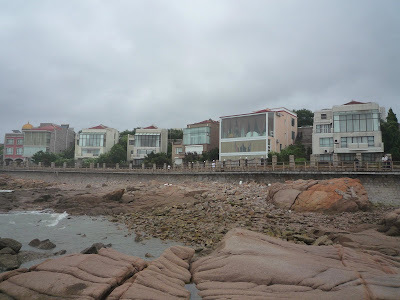 The Qingdao Olympic sailing center has become the focal point of a large development plan which features luxury apartments, shopping malls featuring Gucci, Prada and Cartier, along with dozens of seaside villas. After the Olympics, its grounds can be recast as a luxury hotel and the boat landing into a marina for local private sailboats and speedboats. Transportation in this area of town is almost totally centered on private vehicles with expansive parking lots for Porsche SUVs, Range Rovers, and the always-popular black Audi A6 sedans. A single-line subway which would ease congestion and allow easy access from the wealthy north of the city to the poorer south and west side of town is neither under construction nor planned. Those citizens that endure the long bus ride across town face privately fenced and policed communities that close off most of the scenic areas to the public, although the beaches remain open for public use. Unlike many Beijing residents who are overwhelmingly supportive of the games seemingly no matter what the cost, several people I spoke to in Qingdao were more skeptical of the Games’ trickle-down effects. One man in his mid-thirties remarked that for the rich all the growth has been very good but the ordinary people have gotten no real benefits and many have been forced to move further inland due to development. 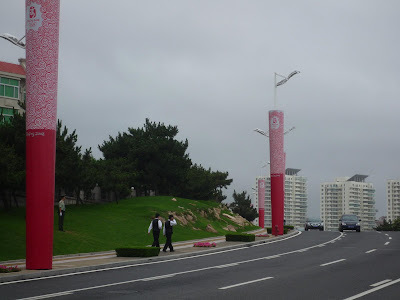 The wide clean streets of north Qingdao with PLA troops providing security and Olympic themed lights. The situation in Beijing is more complex and diffuse. The sheer number of Olympic venues has entailed they be spread around town, but in general they are in the northern half or the edges of the city where many of the new middle class live. The Olympic Park is easily reached from the leafy university district of Haidian or the wealthy business district of Chaoyang but any spectator coming from the overwhelmingly working class district of Fengtai in the south of the city is forced to transfer repeatedly. 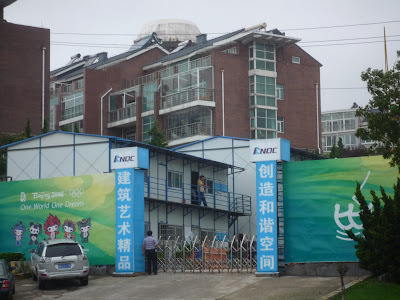 Local teams such as the blue collar Beijing Guo’an soccer team continue to use old facilities in the south of the city which have been not included in the Olympic facelift. In contrast, the massive Olympic tennis center on the north side of town is adjacent to large new parks, has convenient access to major roads, and boasts a large car park. The four billion dollars spent on the new Airport Terminal Three has not been matched by any redevelopment of either of Beijing’s chaotic train stations. Instead of building new waiting rooms in the train stations to disperse crowds and increase comfort, armed security guards patrol the corridors and man the entrances. New rail lines are being built for comfortable, high-speed trains traveling between large cities but the lack of spare capacity and the poor infrastructure that was fully on display during the New Year snowstorms remains an issue. While the Beijing Olympics have proved to be widely popular with the Chinese public at the moment, future generations might not be so forgiving of the massive subsidization of playgrounds for China’s rich.